Kayrock Screenprinting is excited to announce "Note To Self" -- an open-call collaborative book project. The theme of the book is a Post-it note you leave for yourself as a daily reminder. What do you want to make sure your future self will remember? Call Mom? Keep working on that thing even though it's hard? Please use a plain 3" square Post-it with no printing and draw with a pen. Send a scan of a Post-it at 720 dpi or take a close up phone photo. Multiple submissions are ok.
Space in the book is limited. Kayrock will notify artists selected to be included in the book by Friday, November 30th. Due to the high volume of submissions, we will not be able to notify those whose image is not selected for inclusion in the book. All artists will be credited in the book. 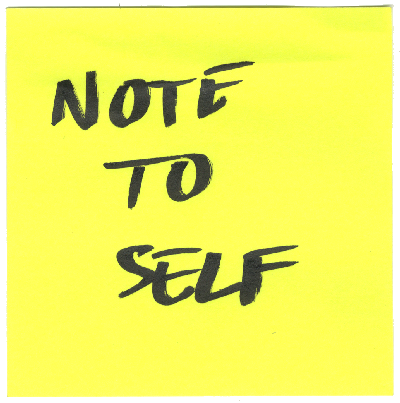 By submitting your note, you are allowing Kayrock to use the image for all related promotion of "Note To Self". Everyone in the book will get one copy of the screenprinted, hand-bound book and an invitation to the book release party.